As ships are moored in this port, you will be tendered ashore. 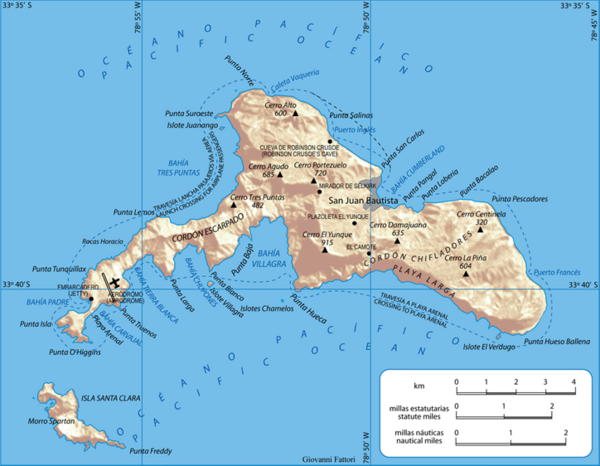 Robinson Crusoe island, also known as Juan Fernández Island, is located in the archipelago of Juan Fernández, 414 miles off the coast of South America. It owes its name to the story of the shipwreck of Alexander Selkirk, immortalized in the famous novel "Robinson Crusoe', by Daniel Defoe. True to its description in the story, the island is a fascinating lost paradise, with an endemic flora and fauna that is unknown in other latitudes. Seventy percent of the plant species in the island are endemic, and you may see the Juan Fernández fur seal or the Juan Fernandez firecrown, both unique to this area. The archipelago is currently a World Biosphere Reserve. Its landscape does justice to the novel, with peaks rising 1,500m above sea level, paths for walks and a beach with temperate waters where one can swim or scuba dive in places where there are sunken ships or fish for lobster. The island is utopia come to life. The island receives a special kind of tourist such as naturalists or people who dive for sport and also demanding adventurers because there are very few comforts to be found here. Instead, you may enjoy a savage and virgin nature that captivates and causes quite an impression on everybody who goes there. Robinson Crusoe's marine ecosystem is quite nearly as unique as its terrestrial ecosystem - and every bit as beautiful. Excellent visibility, steep sea cliffs, vast schools of endemic fish species, and abundant spiny lobsters attract connoisseurs to this little-known dive paradise.